Avalokiteshvara, the Bodhisattva of Infinite Compassion, may be the most well-known and beloved of the iconic bodhisattvas. Throughout all schools of Mahayana Buddhism, Avalokiteshvara is venerated as the ideal of karuna. Karuna is the activity of compassion in the world and the willingness to bear the pain of others. The bodhisattva is said to appear anywhere, even in hell realms, to help all beings in danger and distress. The Sanskrit name "Avalokiteshvara" is interpreted many ways -- "The One Who Hears the Cries of the World"; "The Lord Who Looks Down"; "The Lord Who Looks in Every Direction." The bodhisattva goes by many other names. In Indochina and Thailand, he is Lokesvara, "The Lord of the World." In Tibet he is Chenrezig, also spelled Spyan-ras gzigs, "With a Pitying Look." In China, the bodhisattva takes a female form and is called Guanyin (also spelled Quanyin, Kwan Yin, Kuanyin or Kwun Yum), "Hearing the Sounds of the World." 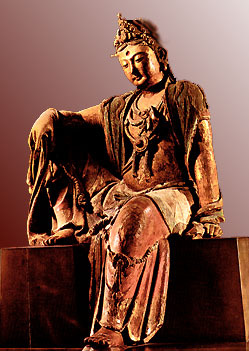 In Japan, Guanyin is Kannon or Kanzeon; in Korea, Gwan-eum; in Vietnam, Quan Am. Most scholars say that until the time of the early Sung Dynasty (960-1126) the bodhisattva was portrayed in art as male. From the 12th century on, however, in much of Asia Avalokiteshvara took the form of a mother-goddess of mercy. Exactly how this happened is not clear. Sometimes the bodhisattva is pictured with features of both genders. This is symbolic of the bodhisattva's transcendence of dualities, such as male-female gender distinctions. Further, the Lotus Sutra says that the bodhisattva can manifest in whatever form is best suited for the situation. There are more than 30 iconographic representations of Avalokiteshvara in Buddhist art. These are distinguished by the number of heads and arms the bodhisattva displays, the bodhisattva's body position, and by what is carried in the bodhisattva's hands. 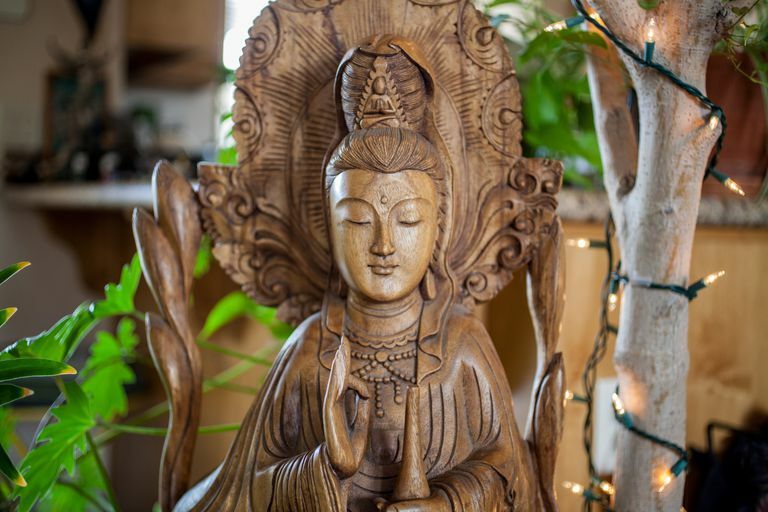 In some schools, Avalokiteshvara is thought to be a manifestation of Amitabha Buddha, who represents mercy and wisdom. There is often a small figure of Amitabha gracing the bodhisattva's head. This buddha may hold a lotus, mala beads, or a vase of nectar. He may be standing, in meditation, or seated in a "royal ease" pose. The bodhisattva often has multiple heads and arms, which symbolize his limitless capacity to perceive suffering and to help all beings. According to legend, when Avalokiteshvara first heard the suffering of the world his head burst from pain. Amitabha, his teacher, took the pieces of his head and remade eleven heads in its place. Then Amitabha gave Avalokiteshvara a thousand arms with which to ease all suffering. "Avalokiteshvara Bodhisattva is the Hearer of the Cries of the World. And one of the characteristics of Avalokiteshvara is that she manifests herself in accord with the circumstances. So she always presents herself in a form that's appropriate to what's going on. In the Bowery, she manifests as a bum. Tonight, in barrooms across the country, she'll manifest as a drunk. Or as a motorist on the highway, or as a fireman, or a physician. Always responding in accord with the circumstances, in a form appropriate to the circumstances. How is that? "Every time there's a stranded vehicle on the side of the road and a motorist stops to help Avalokiteshvara Bodhisattva has manifested herself. Those characteristics of wisdom and compassion are the characteristics of all beings. All Buddhas. We all have that potential. It's just a matter of awakening it. You awaken it by realizing there's no separation between self and other." Do not think of the bodhisattva as a being separate from yourself. When we see and hear the suffering of others and respond to that suffering, we are the heads and arms of the bodhisattva.